Gospel Connection: In this lesson, children learn to listen closely to what God is trying to tell them. When Jesus was on the Earth many people did not believe He was the Savior even though He told them plainly that He was. Likewise, we have to listen for God’s voice in the midst of our lives. Listening to God may be difficult but is well worth it. The end result is living in God’s will. Learning Aim: I can listen to God. Introduction: Welcome each child as they arrive to class. Play a variety of sounds to the class such as a car horn, music, a cow, a siren, a lion’s roar, cartoons, a weather alert, etc. Instruct the class to move to the left side of the room if the sound is something important that they should listen to. If the sound is unimportant, then they move to the left side of the room. Say, God gave us a sense of hearing which helps us understand the world around us. So far today you have heard sounds that are important to listen to, such as a police siren, and sounds that are just for fun, such as music. The most important thing that you can listen for is the voice of God. Sometimes God speaks out loud and sometimes He speaks through preachers or just when you read the Bible. Either way, it is very important to listen to whatever God may be trying to tell you. Biblical Evidence: Read John 10:22-30. Say, The Jews had been waiting for a Savior for centuries, but it was still hard to believe that Jesus was actually there. They could hear him say that He was God’s son, but they couldn’t believe it. Jesus calls the people who believe in Him His sheep. What do the sheep, aka Jesus’ people, do? They listen to Jesus. What does Jesus do for His sheep? He gives them eternal life. So is Jesus’ voice something important to listen to or not? Allow children to discuss how important it is for them to listen to God. Ask, We can’t talk to Jesus in person like the Jews did so how are we supposed to listen for God? Ask a child to read Psalm 46:10 as an answer to this question. Say, We hear the Lord when we are still and listen for Him. God might not speak out loud to us each time we listen for Him, but we still need to spend lots of time listening for Him. Reading the Bible and praying each day is a very good way to listen to God. Say, So what do we get when we listen for God and become one of His “sheep”? We get eternal life, which means we go to Heaven and live with Jesus after we die. Read John 10:28 again. Say, Using our sense of hearing to listen to God is very important. Learn the Focus Verse: Use these motions as you say the Focus Verse to help your students memorize it. “My sheep listen to my voice” –Hold hand to your ear like you are listening. “I know them” –Point to your head. “And they follow me” –March in place. What Would You Do: You may want to break the class up into small groups for this activity. Pretend that you are at school and a friend says the following things to you. What should you do or say in response to these things? Which conversations honor God? Read each sentence or sentences to class and then discuss. Did you hear about what happened at recess yesterday? One of Kimmy’s braids got caught on the monkey bars and they had to cut her hair! Did you hear the story that Mrs. King told yesterday? She said a man named David was thrown into a lion’s den and the Lord saved him. My brother said he can do a backflip off of the roof of the house. I bet you can’t do that. I can’t play today because my sister is sick and I am going to help her with her chores. 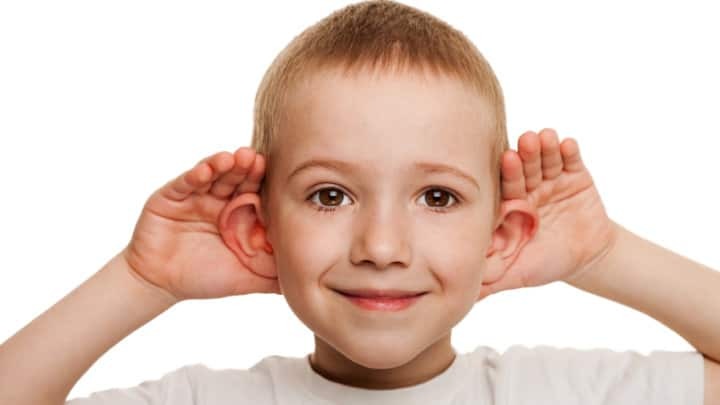 Say, Part of having a sense of hearing is listening to others. It is important to make sure that we listen to good things and only say things that are kind to others. Simon Says Remix: For this version of Simon Says spread out and then play as usual. When a child messes up instead of being out they will freeze in their place. Once several children are frozen, yell “TIME TO LISTEN UP! 5-4-3-2-1!” When the children who are still in the game hear this they must quickly run to their frozen friends and fist bump them to set them free. When you get to ,1 the game continues as normal. Play until only one child is left. Say, Listening to God is important. During this game listening closely meant that you were able to help your friend get back into the game. In life, you can listen closely to God and then tell your friends about them. Listen Up: Give each child a piece of cardstock and crayons. Have each student create a sign that says “Listen to Jesus.” Encourage them to be creative. Use masking tape to attach a paint stir stick to the back of the sign. Remind the children to take time to stop and listen for God daily. Closing: Close the lesson by bringing the class together to pray. Say, Today we learned about how we can use our sense of hearing to listen for God. Let’s pray together and thank God for speaking to us. Lead the class in prayer and dismiss. Ministry-to-children have exceeded my expectations. My kids love the games and different activities! You all have really made teaching bible study so much fun and easier. I can not thank you enough! I pray that God continues to bless this ministry abundantly. Tony Kummer (Editor) reviewed & updated this page on : July 3, 2015 at 1:07 pm. All our content is peer reviewed by our readers, simply leave a comment on any post suggest an update.